With six horses currently competing at the Grand Prix level in show jumping, Daniel Bluman has slowly and steadily worked his way to the top through great horsemanship and care. Already in 2018, Bluman, 28, accomplished two huge CSI Grand Prix triumphs and one national Grand Prix in Wellington on three different horses all within two weeks. In February, Bluman first captured the $205,000 NetJets CSI4* Grand Prix aboard his Olympic partner Sancha LS, and a week later, he won the $384,000 Fidelity Investments CSI5* Grand Prix riding Landriano Z, owned by Over the Top Stables LLC. That same week, he also topped a national show. 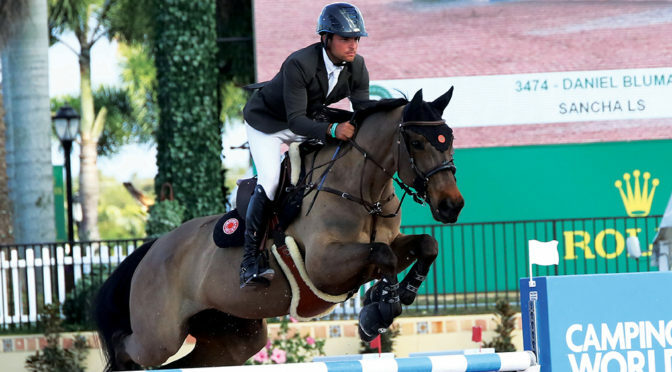 The two-time Olympian for his native Colombia holds dual citizenship with Israel and recently switched flags in his efforts to qualify an Israeli show jumping team for the 2020 Olympics in Tokyo. But first, he hopes to represent Israel aboard Landriano Z at the FEI World Equestrian Games this September in Tryon, N.C.
Born in Medellin, Colombia, Bluman showed a passion for horses early on. His parents were not riders, although his cousins, Ilan and Marky Bluman, introduced him to riding and fueled his passion for the sport. His family later moved to South Florida, within an hour’s drive of Wellington. Bluman’s grandfather was a Holocaust survivor who moved to Colombia after the war. His father became an entrepreneur and his mother, a psychologist and social worker. His parents set high standards for Daniel and his brother Steven. As a young man, Bluman was mentored by them, and many others along the way. “I have been fortunate to have met a lot of great people who helped my career,” he said. He rode with some of the sport’s greats, such as Canadian Eric Lamaze and later Brazilian Nelson Pessoa, whom he trained with in Belgium. The opportunity gave him a chance to compete at some of the world’s most prestigious competitions. He competed at his first Olympics at the age of 22, representing Colombia in London in 2012, and then again at the 2016 Olympics in Rio de Janeiro. The two riders, one up-and-coming, one an established champion, hit it off. In 2015, Daniel and Ilan Bluman created Bluman Equestrian, with farms in Brewster, N.Y., and Wellington, in collaboration with the owners of Over the Top Stables. Working with his wife Ariel and cousin Ilan, Bluman hopes to compete in Tokyo on what would be Israel’s first Olympic show jumping team with Mexican Alberto Michán, who has also changed his nationality to Israeli, and Wellington-based Israeli Danielle Goldstein. One of the great things Bluman has emulated is excellent horse care, building a great relationship with each horse and not over jumping his horses. He is thrilled by his current successes and the chance to train so many horses to the top level in one season. But don’t expect Bluman to be out partying after a big win. Changing his nationality with the Fédération Equestre Internationale (FEI) to ride permanently for Israel was not an easy decision. After riding for Columbia in Rio, he felt it was time for a new chapter. “I got married to a woman who represents Israel. It’s time. It’s the right decision, and only amazing things have happened since,” he said. With all the success, Bluman keeps a tight ship. Once WEF ends, Bluman will be off to Europe to prepare for the World Equestrian Games. The FEI requires that the top teams qualify from this year’s WEG for the 2020 Olympics. It’s the horses and the daily interaction with them that drive Bluman. To keep up with show jumper Daniel Bluman, visit www.blumanequestrian.com.